These functional artifacts for the home are absolutely stunning and reflective of one's priorities in a modern time. Petrified Wood, Agate, Crystal, Metal, are materials that when combined, create meaningful works of art. James Vilona loves his own interior to call upon what he loves the most, nature. Using nature's artifacts and materials allows Vilona to build functional pieces for his clients that are aesthetically beautiful. Vilona's mission is to fill as many homes with this style of art and furniture to help create spaces that are meaningful, beautiful, and most importantly, reflective of what surrounds us and supports us all. “The most important parts of my life have involved my hands. I can look down at my calloused hands and see the effects of my materials, reflecting back to where I started, mining, cutting and faceting precious stones in Brazil. The challenges of mining have given me so much appreciation and understanding for the minerals I work with; it is something I am extremely thankful for. Mining in Brazil led me down a creative path that made me an artist, reflecting on this unique perspective when it comes to knowing where the materials originate. I am constantly working towards increasing my awareness that celebrates the original rawness of a mineral. My goal is to create works of art that gives tribute to these origins. My work constantly inspires me; I realized this method was beneficial for me early on in my career when I first started creating jewelry that allowed people to wear these beautiful gems and minerals. The stones spoke to me in ways that resulted in artistic themed jewelry. I was creating what I call “mini-sculptures” as my mode of relaying shapes with the complimentary colors of the actual gemstones. The way opal reflects the light is something I can see within my color choice in my patinas to this day. I love that I get to be innovative with my artwork; everyday being able to create my visions. Making art is a privilege and I am forever grateful for working with my hands. The dialogue between materials is encouraging for me; the varying metals in my studio offer different opportunities. Learning about how to use a specific metal for a piece of art has opened my mind to better engage it to its fullest potential. I truly see myself in my work, and will always aim towards creating reflective work that relates to my artistic journey as an Artist. I enjoy seeing my work transition into larger than life works, this is something that I always wanted to manifest. The sculptures I create now are much larger than the pendants and rings I started from, but they have so much parallel in relation to one another. Whether it is the metal or the stone, I am still working with the raw materials I started with. Born September 11, 1955. University of Colorado 1975-1979. Member of American National Ski Team through 1979. Served a formal Sculpture and Gem Cutting Apprenticeship from 1980-1983. Owner, Designer and Model maker for Nagalle Designs Jewelry from 1992 to 2004. Numerous International exhibitions of precious metal sculpture and high end diamond jewelry. Educational apprenticeship in Africa, Italy, and Bali. Current associations include participation in the Public Seating Project, ongoing airport installations and rotating art exhibits throughout America, Italy and France. Ongoing commissions include public works for city municipalities, international airports, city public parks, 5 star hotel lobbies and formal gardens within Hong Kong, Paris, Milan, Bali, New York, Florida and Colorado. Private works include collaborative installations for architect's large-scale projects as well as executive homes nationwide. Jim Vilona began his sculpting career after college in Breckenridge, Colorado in 1978. His works have been created using natural stone materials and have gravitated to more fluid metals, to include Bronze and steel sculpting. "I love using a blend of mediums as my passion for change dictates." "When I bend metal or pour a casting it gives me great pleasure to see what the fluid metal will do with my ideas." "I love working with rich woods and bronze, and have created beautiful functional designs with both elements blended into design." 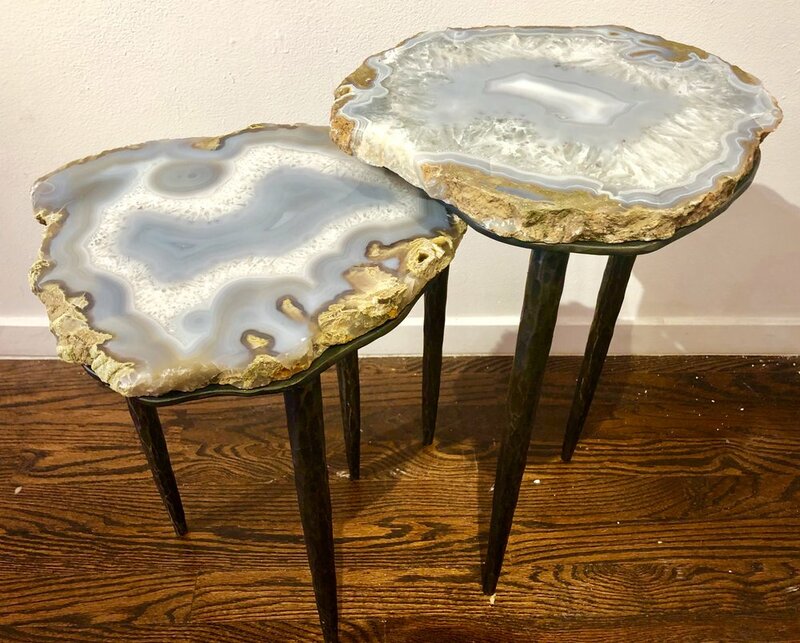 Jim is currently using bronze to showcase natural mineral specimens and has found the marriage of materials most exciting. 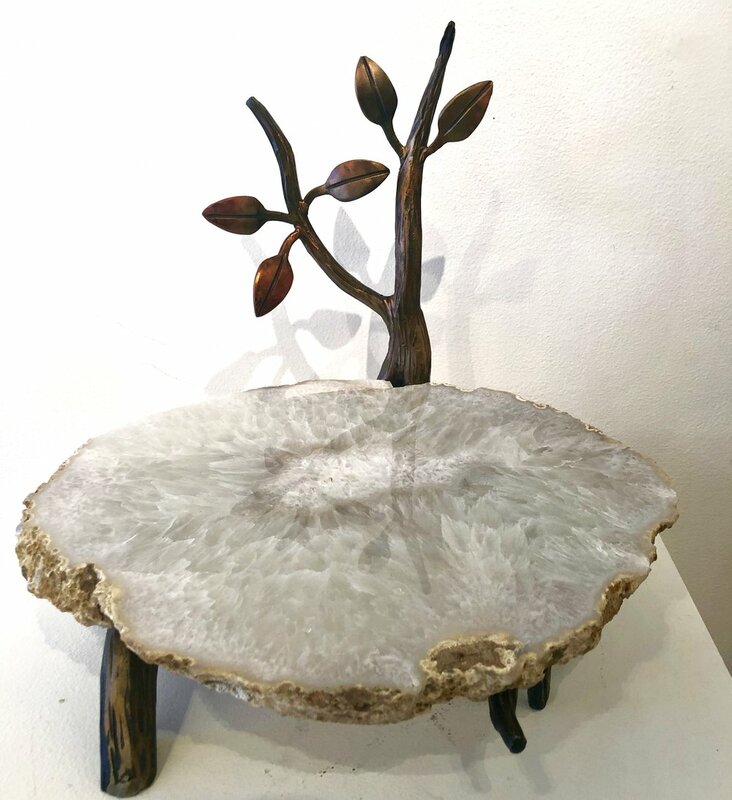 "Using what I have learned in metalsmithing together with my passion for natural minerals has given me inspiration to see where I can take my work". Jim works with fine Galleries nationwide and his Bronze sculpture can be seen in the Time Warner Center in NYC, Art Quest in Marco Island, Florida, River Walk in Ft. Lauderdale, Florida, and Tyson's Galleria in McLean,Virginia.